The Silver Circle Award recognizes individuals who have worked with distinction in the television industry within the Suncoast Region of the State of Florida, the State of Louisiana, the Mobile, Alabama-Pensacola, Florida television market as well as the Commonwealth of Puerto Rico for a quarter of a century or more. The award is given to people who are worthy of recognition for the quality of their contribution to television in the Suncoast region. When the Regional Silver Circle award is voted, it is most always given at the annual Suncoast Regional EMMY® Awards ceremony. 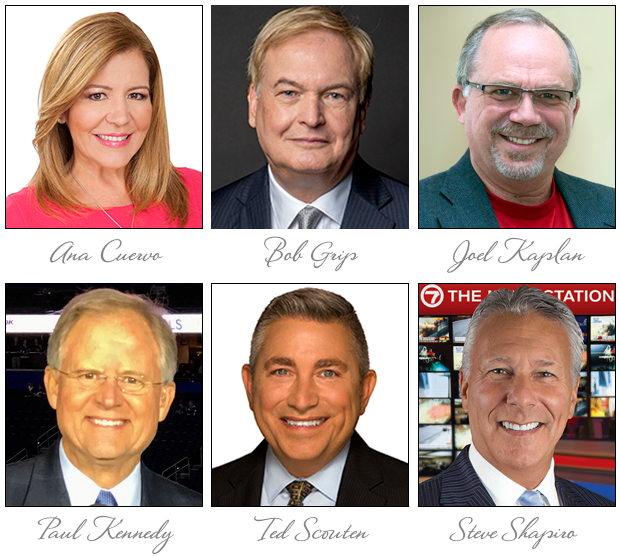 This year’s Honorees are Ana Cuervo, Telemundo 51, Joel Kaplan, Daydream Productions, Ted Scouten, WFOR, Steve Shapiro, WSVN and Regional Silver Circle Honorees Bob Grip, FOX10/WALA, Mobile, Alabama and Paul Kennedy, FOX Sports Florida & FOX Sports Sun, Orlando, Florida. The 31st Annual Suncoast Silver Circle Awards will be presented on Sunday, May 19, 2019 during an afternoon reception and luncheon at the Westin Beach Resort & Spa in Fort Lauderdale. If you would like to attend the luncheon to celebrate these impressive careers, click here. Ana Cuervo is a reporter for Telemundo 51 News, which airs Monday through Friday at 5:00 PM, 5:30 PM, 6:00 PM and 11:00 PM on Telemundo 51 Miami / WSCV, the local station that serves the Spanish-speaking community of South Florida. Bob anchored the prime weeknight newscasts on WALA-TV/Fox10 in Mobile, Alabama for 34 years, and has been a broadcast journalist since 1975, when he started as a reporter at Mobile’s WKRG-TV. He is active on Twitter and Facebook, and was the first webmaster of Fox10tv.com. He is acknowledged as the area’s fastest and most accurate source for election results. For 25 years, he taught broadcast and then multi-platform journalism at Spring Hill College. Joel Kaplan, Daydream Productions, is a former NATAS Board Member and has been involved with local and national television productions since 1978. His experience runs the gamut from PBS documentaries to local WPBT news programs, multi-camera field productions, children’s programming, entertainment specials and national charity productions. Paul is is a television broadcaster entering his 30th year covering sports in Florida. He currently holds the position of Host for Tampa Bay Lightning and Orlando Magic telecasts on FOX Sports Florida and FOX Sports Sun. Kennedy is based in Orlando, Florida and has been on our air since the launch of Sunshine Network in August 1988. Multiple Emmy award-winning WFOR journalist Ted Scouten has been the familiar face at the scene of international stories that have affected South Florida since 1998. Ted has reported on stories all over the US, Caribbean and Latin America. He was on the scene of the devastating earthquake in Haiti less than 24 hours after it happened. He also arrived in NYC less than a day after the 9/11 attacks. Steve Shapiro anchors 7 NEWS weekday sportscasts at 6:00PM, 6:30PM, 10:00PM and 11:00PM. He also hosts 7’s Sports Xtra Sunday nights at 11:30PM. Steve joined WSVN as a sports anchor/reporter in 1997. In November 2003 Steve became WSVN’s lead sports anchor. Prior to WSVN, Steve served for several years as sports director/anchor at WCIX/WFOR CBS in Miami.